Tour Tor House, climb Hawk Tour, reminiscent of ancient Irish stone towers. Stroll through an English cottage garden rich in color, texture and fragrance. Experience the atmosphere that inspired some of America's finest poetry. Step back in time and follow the romance of Carmel's poet. 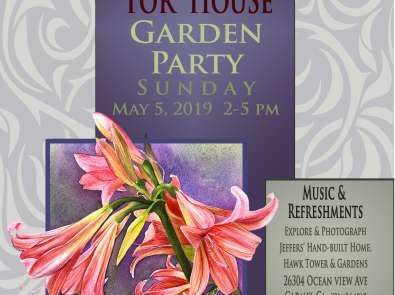 Docent-led tour of Tor House, Hawk Tower and the old-world gardens are conducted hourly every Fri. and Sat. The first tour begins at 10 a.m. and the final tour at 3 p.m. Each tour is limited to a maximum of six people. Tour costs are $12 Adults, $7 full-time students 10 years old and older. Tour reservations should be made in advance via the Tor House web site, on the “Tours” page. We accept credit card, checks, or cash. You can also make tax-deductible donations to support the Tor House Foundation on our “Giving” page. Visit www.torhouse.org to learn more and follow us on our Facebook page www.facebook.com/torhouse.